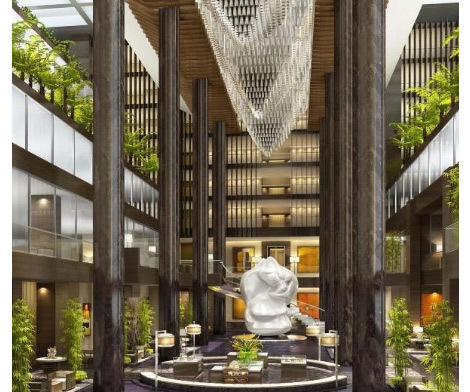 Hyatt has opened its first Park Hyatt hotel in Hyderabad, and only the second property under the brand in India, joining the Park Hyatt Goa Resort and Spa. Park Hyatt Hyderabad is located in the Banjara Hills district of the city, and offers 185 rooms, as well as 42 residences on the top two floors of the property. Design features include a 35-foot tall, white, abstract sculpture in the lobby, a facade clad in Madurai granite, a porte-cochere with a “shimmering steel mesh ceiling fixture”, and interiors inspired by henna patterns and sari designs. Rooms start from 45sqm, and feature spa-style bathrooms with free standing bathtubs. Food and beverage choices include the Italian Tre-Forni, serving “light and flavourful dishes from Northern Italy’s Veneto, Lombardia and Liguria regions”, the Dining Room for Hyderabadi and classic European dishes, and Oriental Bar and Kitchen for tapas-style Southeast Asian snacks. The spa features treatments inspired by “the royal Nizams of Hyderabad”, and facilities include a fitness centre, swimming pool, Swedish sauna, steam room and beauty salon. There is around 1,600sqm of events space including a pillar-less ballroom and seven meeting rooms, accessible by a separate entrance. Hyatt currently operates nine properties throughout India, including Grand Hyatt hotels in Goa and Mumbai, and Hyatt Regency properties in Chennai, Kolkata, Mumbai, Delhi and Pune. The Park Hyatt Chennai is also scheduled to open later this year. For more information visit hyatt.com, and for recent reviews of the new Park Hyatt and Hyatt Capital Gate properties in Abu Dhabi, click here.